I’m a millennial Christian. You know, part of that generation that we hear is leaving the church in droves. There’s a lot of finger-pointing going around about why this is happening. Millennials are non-committal and lazy, we hear. Or it’s the church’s fault—it’s not inclusive enough. Casting blame aside, there’s a legitimate struggle going on. Even as a committed Christian, it’s challenging for me to line up typical church activities with what I see as important and meaningful. And this situation is challenging for churches who want their congregations to thrive, and not to fizzle out. Church leaders have to ask themselves the question: How do we stay relevant as culture changes under us? 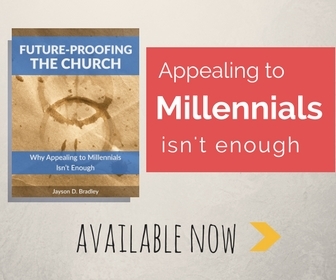 Jayson D. Bradley, who’s one of the main writers here at MinistryAdvice, recently came out with the book, Future-Proofing the Church. In it, he draws from years of ministry experience to explore answers to this question. It’s a great read, and you should definitely pick up a copy. I asked him some questions about the book; you can read the whole interview here. In Future-Proofing the Church, you suggest that the world is going through major cultural shifts. I imagine many critics would ask why a timeless entity like the church should concern itself with cultural changes. Are you suggesting that the church should cater to the culture? We can’t deny that culture is context. The way we experience the world around us, the way that we understand and entertain ideas, is largely shaped and impacted by our surroundings. If you think about it, even the metaphors our culture uses to explain who God is casts a large shadow over our understanding. Western cultures are extremely law oriented, so it makes sense that a lot of the metaphors we use to explain how God functions are legal. We’re told that, as sinners, we stand before a judge who finds us guilty and deserving of punishment, but that our fine is paid for by Christ’s sacrifice. This makes sense to us, but there are many cultures around the world who wouldn’t resonate with that analogy because, culturally speaking, they have no real basis to understand it. When you’ve heard a metaphor enough, you begin to think that the metaphor is the truth. But you miss the subtle ways that the metaphor might be diminishing the truth. Even the phrase “cater to the culture” comes out of a culture where the one of the central tenets is that the church and the culture are at war. The minute someone says “cater to the culture,” they’re invoking the idea that the church is hurting itself and its message by compromising or adapting to the culture. I’m not sure that the early church would have agreed. To the Jews I became as a Jew, so that I might win Jews; to those who are under the Law, as under the Law though not being myself under the Law, so that I might win those who are under the Law; to those who are without law, as without law, though not being without the law of God but under the law of Christ, so that I might win those who are without law. To the weak I became weak, that I might win the weak; I have become all things to all men, so that I may by all means save some. On some level he’s catering to the culture in that he’s adapting his message and behavior in a way that can be understood and accepted by his listeners. What do you see as the biggest threat to the church? We’re starting to see a real polarization between the generations. I know so many boomer and gen X Christians who see no problem talking negatively about millennials. They call them entitled, self-absorbed, wasteful . . . the list could go on and on. At the same time, they know they need millennials at their churches if they’re to survive. This perpetuates a really ugly perception about the church that we’ll pursue groups we resent in order to survive—and call it love. The premise of Future-Proofing is that the tech boom and the introduction of the Internet kicked off a cultural change that’s only in its infancy. Millennials represent the first generation that don’t really have a before/after perspective of this shift. They were born into this postmodern world and, in many ways, what that the rest of us are adapting to is simply business as usual to them. I don’t think we begin to fathom the societal changes that are coming. My fear is that the church will continue to see this as a generational problem and squander valuable time fighting inevitable changes. Eventually those of us who lived in a time of encyclopedias and rotary phones will be gone and these changes will occur. Maybe we could help shape them instead of simply resisting them. We can’t afford to trade in our effectiveness in order to protect structures and traditions that might be doomed anyway. How would you describe a church that is poised to survive the coming cultural shift? I think survive might be the wrong word. As long as there are boomers and gen Xers, churches will continue exactly as they are. Even when we’re all gone, many of these churches will exist based on countercultural millennials who have held onto the perspectives of those who have preceded them. I think that these churches will continue to resist change and believe that they’re a faithful remnant in doing so. They won’t flourish, and they’ll see that stagnation as a badge of honor for their dedication to truth and tradition. I think that the churches that are poised to prosper with the the coming cultural changes are the ones that are learning to be minimalistic in their doctrine and overhead. The more weighed down they are by superfluous theology or property and staff, the less likely they will be able to adapt to the rapidly changing road ahead. What’s the difference between churches adjusting for cultural shifts and churches becoming worldly? That really depends on who you ask. During the Jesus People movement in the sixties and seventies, many churches didn’t want anything to do with these long-haired, shoeless hippies who were showing up at their churches with their culturally influenced music. I’d say that they were failing at adapting cultural changes, but they’d say that they were protecting themselves from worldliness. On some level every change is met with resistance by people who are protecting the status quo with an argument that they’re staving off compromise. In the end, the changes usually happen. And in the process, many people who want to get closer to Jesus end up embattled and hurt. The difference between adaptation and worldliness ends up being about perspective. How do you see the pastor’s role shifting in the coming years? I think that there are a number of ways that pastoral ministry will need to change in the future. I think that we’ll see a movement toward more holistic ministry and away from pastoral celebrity culture. If the church is to survive, pastors need to be more about discipleship than homiletics. The church is filled with people who are broken in very unique ways. The one-size-fits-all teaching model isn’t helping people recognize where Christ is at work in their life and how they can work in harmony with him. In many ways, the current model packages Scripture with pastoral opinion, presents it as unequivocal truth, and ends up solidifying cultural polarization. Let me give you an example of how things are changing: As a kid, I asked my parents tons of stupid questions. When I grew up, I realized that when they didn’t know the answer they’d often give me their best guess, and sometimes it was completely wrong. But at the time, I accepted their answers as God’s truth. Churches used to operate the same way families did. They had a central authority figure that had access to information that they didn’t. They accepted the minister’s word because they really didn’t have any other choice. Now I can sit in the pew and fact check my pastor in real time. I have access to most of the same information he/she does. But I don’t have my pastor’s unique relationship to God. Maybe I don’t have his/her calling. It’s likely that I don’t have my pastor’s maturity, depth, and spiritual insight. I think the way that informational technology is leveling the playing field means that pastoral ministry will need to be more about spiritual direction and guidance and less about having all the answers. 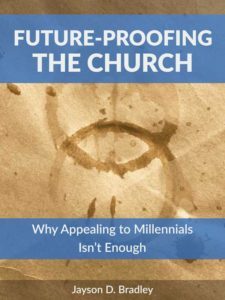 The book’s subtitle says, “appealing to Millennials isn’t enough.” What does a church miss by strictly trying to appeal to a younger generation? “Appealing to Millennials isn’t enough” because it misses the bigger picture. When I was a teenager, churches could have done a better job trying to appeal to generation X. I don’t think that anything’s lost by learning to speak a generation’s language. Millennials are different because I think they’re looking for something entirely different than we can give them if we just tried to cater to their desires. For instance, Millennials see a world that’s much smaller than the one I was raised in. They want to see a church mindful of humanitarian causes and serious about social justice. We don’t attract Millennials by dabbling in concern for others. We either commit to becoming merciful and justice oriented or we don’t. There’s no opportunity for a bait and switch here. Your book asks more questions than it gives answers. How do you hope it will be helpful? This is really intended to be a short piece to get some discussion happening. Right now, there are no clear-cut answers. This is hard for a lot of people because at the beginning it looks a lot more like deconstruction than solutions. People end up tearing down structures that are no longer producing results. This is really uncomfortable for people who are committed to the status quo. My hope is that it will be helpful as a way for people to discuss change without feeling like they have to insulate or protect themselves from it. In the end, these changes will help us serve Christ more efficiently. Where can people go to participate discussions about topics like this? I started a Facebook group called Creative Ministry Co-op where people can come and talk openly about the future of the church. 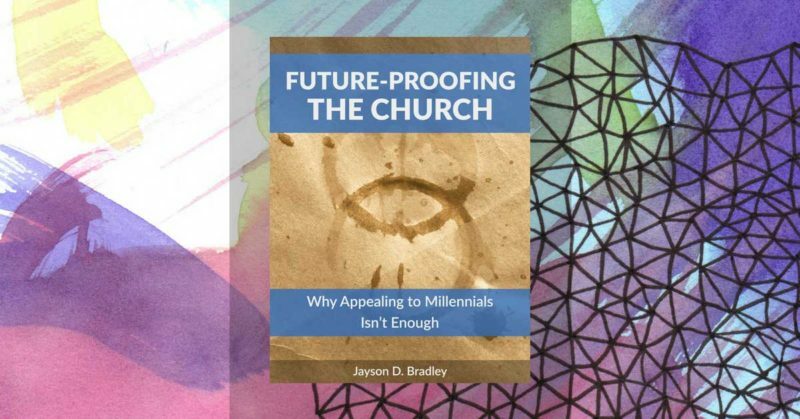 You can read more of Jayson’s thoughts on this topic when you pick up your copy of Future Proofing the Church on Amazon. Are You Sure You Want to Be a Christian Leader?